JAISAL NOOR:	June 17th, 1971, President Nixon declares drug abuse public enemy number one. RICHARD NIXON:	America’s public enemy number one in the United States is drug abuse. In order to fight and defeat this enemy, it is necessary to wage a new all out offensive. JAISAL NOOR:	Decades later, former Nixon advisor John Erlichman told Harper’s magazine, this declaration was an excuse to criminalize Nixon’s main enemies, the anti-war left and black people. Four and a half decades later, the impact is not in dispute. The United States locks up more people than any other country. Some 2.3 million people are behind bars. Half a million of those are for drug offenses. Disproportionately, low-income and people of color. One in eight black men spends time in jail during their lifetimes. Decades of mass incarceration has left generations with criminal records and unable to get stable employment or housing, only further exacerbating the cycle. Mass incarceration is also big business. Billions spent every year carrying out the drug war and locking up offenders. Which is why critics say police and prison guard unions continue to be the war’s biggest advocates. Baltimore was particularly hard hit by the drug war. Hundreds of thousands locked up and with criminal records. BOBBY HOLMES:	They transform communities. It transformed lives. It transformed families. My name is Bobby Marvin Holmes. I’m advocate for youth and families in Baltimore. I have the responsibility of working with youth and families. To offer support to youth and families. Usually, the communities that I work in are marginalized. Are segregated by race as well as segregated by class. We talk about communities that have little to no opportunity and resources. And when I go inside these homes, it’s an opportunity to address the anguish, the pain, the despair, the hopelessness that some of these families are facing. And also to encourage them. Because we have strong communities that keep … Strong families that keep these communities intact but they’ve been so devastated and forgotten by the larger society. So, when we talk about the issues of mass incarceration and the effects of the war on drugs are ongoing. Along with the families I work with, I work with boys who have lost their fathers to incarceration. Who is dealing with the fact that their father is not here. I have a young man that I used to work with that he’s now 18. He’s never seen his father outside of prison walls. That type of trauma, that type of deprivation speaks volumes. And it goes on, it has a ripple effect. So, the anger that this young man feels, he acts out in many different ways. It comes out in many different ways. And the family has to deal with that, I have to deal with that. And when he goes out in the community, folks have to deal with that. When I asked her, “Okay, when your father come home?” She said her father is not coming home until 2046. So, this young lady’s going to be an adult by the time she see her father free again. That loss, that pain, that anguish, without the right support it will fester. I mean, already, she was sitting in class today, upset, crying ’cause she miss him. Imagine what that is going to look like when she grow older. She was strong, she was resilient to discuss the pain she was feeling. Discuss the fact that she missed her father. That was real and it needed to be addressed right then and there. But that speaks to where we are in society. Where again, you rip families apart by taking mothers and fathers out of the picture. And now they are sitting, festering away in warehouses with bars, basically. And the family is feeling the pain. Not too long ago I heard a woman say her husband is incarcerated. She said, “I feel like I’m doing time with my husband. He’s incarcerated, I feel incarcerated with him.” We’re tearing families apart and I think that’s the point that we’re missing. It’s easy to say, fight crime. It’s easy to say get the bad guys off the streets. But we’ve got to be careful in what are the effects of that. Again, I do believe we should address crime. Yes, we should hold folks accountable but how we hold them accountable and how we support them moving forward makes a world of a difference. JAISAL NOOR:	Part of the reason why it’s perpetuated, is that some people are making a lot of money off it. You have the prison, police guard unions, entire communities are being supported by prisons that are being filled up by bodies, mostly black bodies in the drug war. And I wanted to mention that because, how do we get justice for this? We know, as a society we’ve acknowledged this is wrong. But how do we get justice? There’s some proposals to legalize medical marijuana in places like Maryland and other jurisdictions. Is that enough? Or what needs to be done to get justice and get reform for this, what we’ve done to our society? BOBBY HOLMES:	Medical marijuana is … I can’t even say. It’s a step in the right direction in terms of using marijuana as an aid to support those who are unhealthy. Those who have serious, critical health issues and that need that type of aid, that type of support. As far as health care is concerned, I would argue it’s a step in the right direction. Maybe a little bit, in terms of police reform, but again, I don’t think it’s time to pop bottles of champagne and celebrate. That’s no where near enough to address what has already been done. And when we talk about moving forward, and trying to make things right, it’s hard to have that honest conversation when people on the other side of the table is not trying to be honest as well. What I mean by that, is, right here in the State of Maryland, when you have our public officials pass legislation like the Justice Reinvestment Act and push for criminal justice reform, but at the same time wage a fight against advocates trying to push for better reform in the State of Maryland. When you have the bail bond industry flying folks in to testify and support their bill, as they claim that it’s for reform but it’s not. It’s to undermine the Maryland Court of Appeals rule changing. It’s kind of hard to have a genuine conversation when people keep on undermining the work that’s trying to be done now to keep on, to push their agenda. As you mentioned, criminal justice is big business. That’s why the bail bond industry pushed so hard. Again I’m thankful for advocates like Caryn York, Nicole Mundell, leaders of a beautiful struggle who pushed back and ultimately won a fight, this time around, as they did years ago with criminal justice, I mean, police reform. Again, pushing back against folks. But what makes the conversation hard, which makes real reform hard, is when you have people continue to pass legislation and continue to undermine the efforts being done. And here in Baltimore city, saying okay. We’re trying to make reforms. We’re trying to correct our actions. But in the state, the state Maryland General Assembly, they’re saying something different. When they’re pushing for policies that continue to oppress these communities. It’s disingenuous, to say the least. On a federal level, we have US attorney Jeff Sessions, who are now saying, okay. Well, the federal government is now going to do business with private prisons once again. Making profit off of black and brown bodies across our nation. So it’s tough to have the conversation about reform when folks continue to try to undermine these efforts. When the community said okay, let’s go to the table with public officials, with law enforcement agencies, and let’s work together and make a difference. But behind closed doors, deals are being passed to push for tougher criminal justice policies. Criminal justice policies that will only continue the work, that is initiative, that is a push by the Trump Administration to push for these egregious criminal justice policies and laws across our nation. We see it again with bringing private prisons back in the fold. Jeff Sessions is … Attorney General with Jeff Sessions is making it a priority to declare war on drugs. We see how Trump talked about our communities and wanted to address crime in the communities last year during the election. Looking at Chicago. Looking at Baltimore as examples. Okay, we’ve got to crack down on the crime there. That is not the focus. The focus is the continued mass incarceration. Let’s be honest and stop the nonsense and empty rhetoric. That is the agenda, that is the priority, and the community on a local as well as state level, have to push back against that. So, it is really tough to move forward when folks continue to undermine the efforts. JAISAL NOOR:	And so, finally, I wanted to ask you, from your perspective, if the people could set policy. 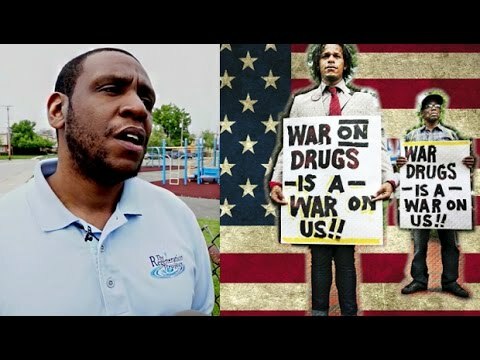 If there was no roadblocks, no political opposition, if we could have our own policy on how to get justice for the damage from the war on drugs, what would that begin to look like? What should the people’s demands be, from your perspective? BOBBY HOLMES:	I think the communities impacted most can speak to that the most. It’s not my position to speak for other communities on what retribution, what reparations look like for them. It is in order. It’s long past due. And I don’t think our public officials are ready to have that type of conversation. If they continue to undermine the work that’s being done for reform. But I do believe they deserve justice. Folks deserve justice for what has been done already. The communities impacted the most deserve justice. And I definitely support any efforts moving forward to seek that type of reform and change. Supporting it any way I can. Not to say that the work is already been done, again with folks trying to advocate for that change. But the communities that were impacted the most need to be the one in the big chair, leading the way on that fight, because it was their families. Again, going back to families. It was their families that were impacted the most. It is their little girls that are sitting in the classroom, crying now because their parent is not there. It’s their little boy that is frustrated and acting out in the community because they no longer have their mother in the picture anymore. Those families need to lead the way. No one else. JAISAL NOOR:	Thanks so much.